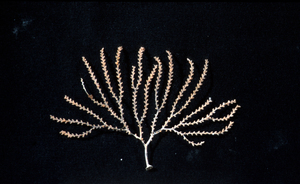 A fern species found on a seamount. Hundreds of new species have been discovered on extinct underwater volcanoes, or seamounts, that rise from the sea floor in the Coral Sea and the Tasman Sea between New Caledonia and Tasmania. Many of these creatures have been isolated on their underwater peaks for millions of years with dramatic implications for their conservation. Seamounts are increasingly being targeted by international deep-water trawling operations. The spread of trawl fisheries for orange roughy, alfonsino, and other deep-water fishes threatens seamount communities worldwide. Picture: Karen Gowlett-Holmes/CSIRO Marine Research. Photographer : Karen Gowlett-Holmes/CSIRO Marine Research.